Every student draws upon his/her personal beliefs and understandings to make sense of their world. When they cannot make sense of information and big ideas that have been provided, they do their best to fill in the blanks. Often they piece information together incorrectly to form misconceptions. It is our responsibility as educators to allow our students time to work through their understandings and test them with other learners' ideas. Through this project, we are working towards understanding our participants' beliefs and understandings about the scientific process of condensation so we can be better prepared to address these misconceptions in our teaching. 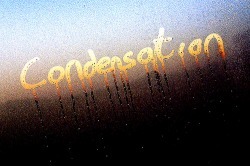 The process of condensation is when water vapor(gas) changes to liquid water. This happens because the water vapor loses energy as it cools. Water vapor is always present in the air. Condensation is crucial to the water cycle because it is responsible for the formation of clouds.These clouds may produce precipitation, which is the primary route for water to return to the Earth's surface within the water cycle. Condensation is the opposite of evaporation. This process is also evident on a hot summer day. When you go to take a sip of iced tea and water drips on you, that is an example of condensation.